A dull, grey and rainy start to the day was apparently going to be “clear from the west”. Sure enough, it did. I set about boning a chicken for the evening’s planned Thai green curry while Carol set off on her bike to get a required grocery or two from the local Spar. With its usual impeccable sense of timing, more dull, grey rain immediately arrived from the west and Carol was wet and we were back where we’d started. We did have the groceries and a boned chicken, though. The spell of weather wasn’t too much of a hardship since we were expecting visitors, our friends Jan and Jon, for the latter part of the afternoon and evening. Jan was first taking part in a 60+ mile bicycle ride around the St. Agnes area (rather you than me) before they came on to a previously arranged meeting point. So, ‘t was out with the books and puzzles to wait for a message announcing their arrival. Puzzle, puzzle, read, read, pitter, patter. 3:00 PM. An odd brightening, a strange blueness, bursts of a strange yellow brilliance, an even stranger lack of wind. Could this be the aforementioned “clearing from the west”? Out with the chairs for the first time this trip. 4:00 PM. SMS message: bike ride over, leaving St. Agnes in 10 mins. 5:00 PM. SMS message: we’re here. Though a Cornwall resident, Jan had never seen Port Isaac, a particularly picturesque fishing port on the north Cornwall coast about eight miles from our camp site. 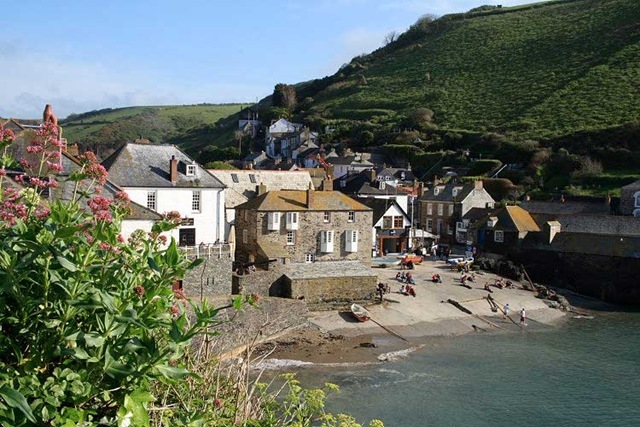 Port Isaac is appealing enough to have been chosen as the location of the TV series Doc Martin for which it acquired the stage name of Port Wenn. Having “cleared from the west”, the evening was very pleasant and off we set for a swift visit before dinner. Port Isaac is a prime tourist magnet, especially having become a TV star. Quite why the pub right on the harbour (called “The Mote”) is so poor, I just cannot imagine. Possibly, they don’t need to put in any effort simply because of the place’s popularity. “Half a dry cider, please.” “We don’t have any cider by the half – all large bottles.” And mostly Magners, I noticed. Cornish cider is great, why would a Cornish pub be selling Irish cider? I know: it’s trendy (and, in my opinion, almost taste-free). Nearly everything here is bottled. There are a mere two pumps: Doom Bar (which is, at least, Cornish) and Red Stripe Lager. “OK, two of us will split a pint of Magners”. There’s a decent looking barista machine to the side – “and a coffee, please”. “Certainly” – unfortunately, the barista machine goes unused because, unnoticed by me, there is also pot of filtered-and-kept-warm-for-Lord-knows-how-long coffee lurking on a partially hidden hotplate. There is a good pub in Port Isaac. 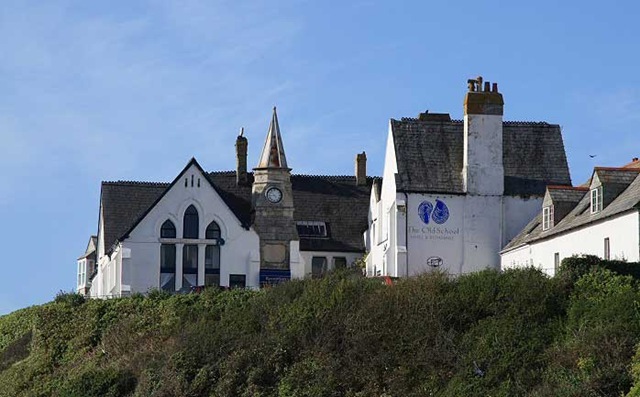 It’s called “The Slipway Hotel” and is very close to the harbour, on the corner immediately opposite the fishmonger’s shop. It has a canopy-covered seating area outside and a decent selection of beverages and food inside. Guess where you should go if you happen to visit Port Isaac?